Do you know Grumpfs? Maybe you have already seen some of those hairy animals in your garden? Well, I have not. Probably you haven't either, because a Grumpf seems to be a fantasy animal, but who knows for sure... Anyway, the French publisher LA BOITE DE JEU teaches us that Grumpfs live in clans and they love to hunt. Once it is hunting time, there is a big challenge for the best places in the hunting grounds, because only the strongest clan on each hunting ground will get the lion's share of the animals living there. So you better be fast and vicious. Each round starts with equipping the hunting grounds with 12 new, innocent animals that are drawn from a bag. Each animal is placed on its matching hunting ground. But, as the drawing takes place randomly, some hunting grounds will have more animals in that round than others. Also, an empty hunting ground can be a legal result. Grumpfs that are sent to these places will end up empty-handed. Not that someone should aim for that (as it really does not at least make any sense), but in the thick of the fray this will happen more often than you would think. First of all, the two sides of each Grumpf token are different regarding their fighting value. Normally you should choose the side with the higher value, because only the strongest players on each hunting ground (adding all of their Grumpf at the ground to a sum) will participate in the prey. But there is still the second fact..
Each hunting ground has its own hunting conditions that must be met by all Grumpfs at this place in sum. These conditions are simple mathematical conditions, e.g. the sum of all Grumpfs' strength must not exceed 20 or the total of all Grumpfs must be equal at this place. As you can see, you must act and react much more deliberated than just following your first impulse. But of course that's easier said than done. When your opponents are fast, you are forced to react, because after the first player has finished there is not much time left to act. 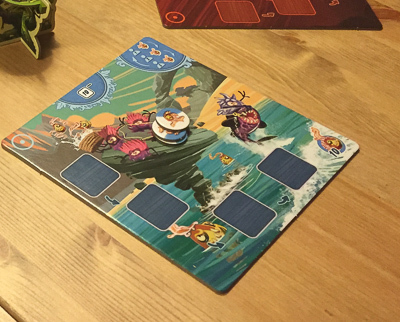 After the hunt, the prey is divided among the strongest players, but only 1-3 players will participate, depending on the individual prey conditions of the hunting ground. The scoring takes place after the game has ended in the fourth round. The victory points are given for series of different animals. So it is not the sheer mass you are heading for, but you also have to watch out for animals you do not posses up to now. 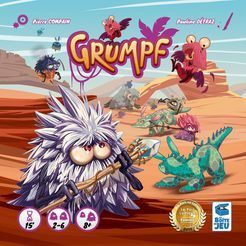 Grumpf, that is a lovely designed, easy and chaotic real-time game. I personally liked it very much, but some of my fellow players thought it was too chaotic. 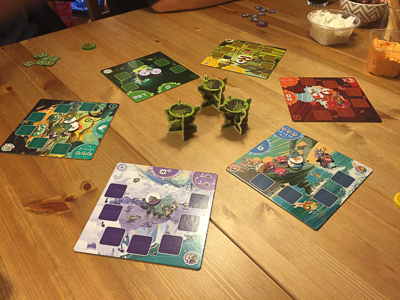 If one or two players speed up, the game has a penchant to end up in chaos. I liked that too, but tactic and strategy only will play a minor role in this particular case. So my 6 year old son won some rounds by just placing all of his tokens to nearby hunting grounds, just because other players had not enough time to react.